Our Cheer-On campaign exists simply to celebrate and encourage individuals and groups in the city who do amazing things, often without any thanks or reward. This month we are cheering on the heroes who serve us selflessly throughout the NHS. 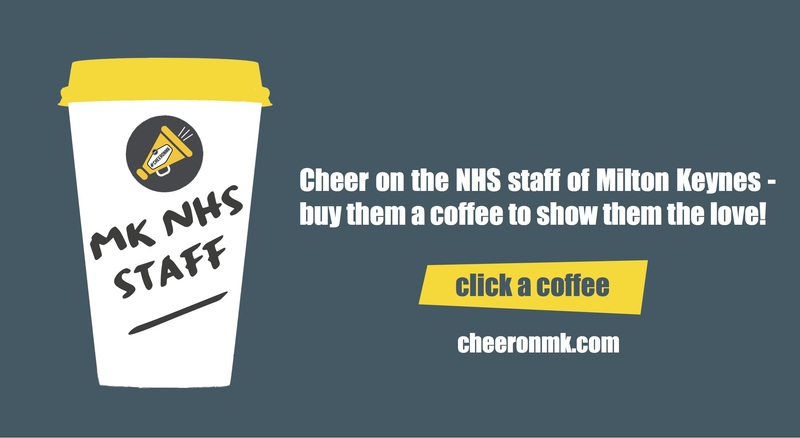 If you’ve ever been helped by a midwife, doc, nurse, surgeon, porter, dentist, receptionist or cleaner in the hospital – why not buy them a coffee to say thanks? If you work for the NHS in any capacity in Milton Keynes – THANK YOU. Head on down to Out of Office Coffee in either Stony or Newport and show them an NHS badge/pass/nurses watch and choose any drink you want – it’s on us! Click here to donate a fiver and spread the love!